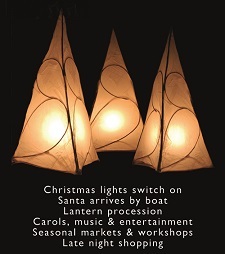 CANDLELIT DARTMOUTH WEEKEND 6 – 7 DECEMBER AT THE FLAVEL – advance information! There will be a small additional charge in the workshop to cover the cost of your chosen vintage china tea cup or glassware or bring your own! Learn how to make candles using natural materials, scented with your own special mix of essential oils as a unique Christmas gift...or just to keep for yourself! Workshop price includes all the materials you need to make your own custom sign, including Farrow and Ball paints and decorative tape for hanging. Why not try your hand at creating your very own piece of artwork? In this workshop you'll learn how to prepare boards for printing and make your own letter blocks that will type out the message you want on your board. Frequently featured in all the homes' magazines and popular on Pinterest and Etsy, these simple but stylish artworks can bring uniqueness to any home. A great Christmas present! at the Bandstand at 2pm on Saturday 7th December 2013 – just turn up with your Christmas Dog !! We are looking for some budding local photographers who can take some really great images that capture the wonderful essence of Candlelit Dartmouth 2013 !!! For all children under 11 years, come along to Candlelit Dartmouth on Saturday morning dressed as Jack Frost or the Snow Queen and you may win a prize for the best fancy dress !!! !